Google on Wednesday unveiled what it has promoted as the "next dimension" of its Maps service, with new full 3D renderings for Google Earth that were demonstrated live on an Apple iPad. Google has been using automated technology to extract data from aerial models captured by airplanes owned by the company. With planes flying overhead in tightly controlled patterns snapping pictures, Google can use the imagery and data to create three-dimensional mapping imagery. Images of the ground are snapped from 45 degrees at four angles, and those pictures and data can be combined to recreate maps in three dimensions. The whole process allows 3D maps to be built without human interaction, unlike with previous 3D imagery in Google Earth. In a live event on Wednesday, Google demonstrated 3D models of individual buildings and entire cities. The new features were shown off to members of the press on an Apple iPad, rather than an Android-based tablet. The company promised that its new 3D imagery will be coming to both iOS and Android devices "in the coming weeks." The technology will be part of both the Google Maps service, as well as its Google Earth application. By the end of the year, Google expects to have communities home to about 300 million people mapped in its new space. Google also revealed that it will bring an offline version of its Maps software to Android devices. The company said it is "working very hard" to bring offline Maps to iOS as well, but did not offer any more information. 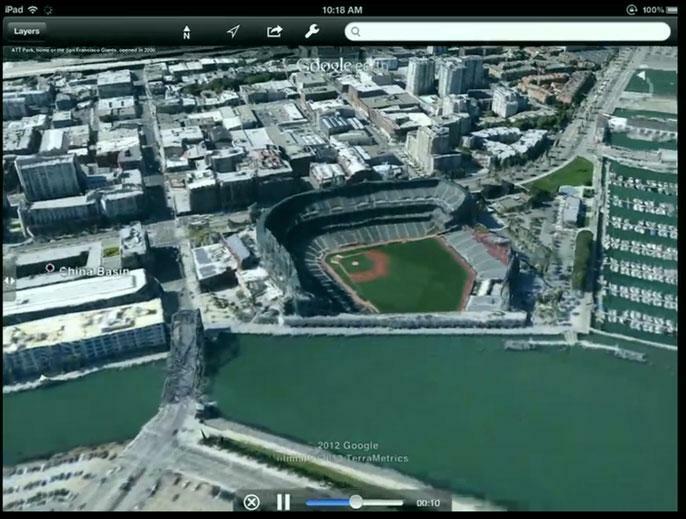 Google Maps 3D demo on iPad, via The Verge. Wednesday's media event comes just five days before Apple is set to hold its own keynote address at the company's annual Worldwide Developers Conference. There, Apple is expected to unveil an all-new version of its Maps software for iOS that will ditch Google Maps. The Wall Street Journal reported this week that Apple's new mapping technology will reach iOS later this year. It is expected that the all new native Maps application will be a part of iOS 6, Apple's anticipated next-generation mobile operating system. Apple's mapping intentions have been evident since at least 2009, when the company began acquiring mapping technology companies. The iPhone maker bought Placebase that year and then Poly9 in 2010. Last year, Apple bought Swedish 3D-mapping company C3.